Vagotomy is the surgical cutting of the vagus nerve to reduce acid secretion in the stomach. The vagus nerve trunk splits into branches that go to different parts of the stomach. Stimulation from these branches causes the stomach to produce acid. Too much stomach acid leads to ulcers that may eventually bleed and create an emergency situation. A vagotomy is performed when acid production in the stomach can not be reduced by other means. The purpose of the procedure is to disable the acid-producing capacity of the stomach. It is used when ulcers in the stomach and duodenum do not respond to medication and changes in diet. It is an appropriate surgery when there are ulcer complications, such as obstruction of digestive flow, bleeding, or perforation. The frequency with which elective vagotomy is performed has decreased in the past 20 years as it has become clear that the primary cause of ulcers is an infection by a bacterium called Helicobacter pylori. Drugs have become increasingly effective in treating ulcers. However, the number of vagotomies performed in emergency situations has remained about the same. A vagotomy procedure is often performed in conjunction with another gastrointestinal surgery, such as partial removal of the stomach ( antrectomy or subtotal gastrectomy ). Gastric (peptic) ulcers are included under the general heading of gastrointestinal (GI) diseases. GI disorders affect an estimated 25–30% of the world's population. In the United States, 60 million adults experience gastrointestinal reflux at least once a month, and 25 million adults suffer daily from heartburn. Left untreated, these conditions often evolve into ulcers. Four million people have active peptic ulcers; about 350,000 new cases are diagnosed each year. Four times as many duodenal ulcers as gastric ulcers are diagnosed. The first-degree relatives of patients with duodenal ulcer have a two to three times greater risk of developing duodenal ulcer. Relatives of gastric ulcer patients have a similarly increased risk of developing a gastric ulcer. A vagotomy can be performed using closed (laparoscopic) or open surgical technique. The indications for a laparoscopic vagotomy are the same as open vagotomy. Truncal or total abdominal vagotomy. The main vagal trunks are divided, and surgery is accompanied by a drainage procedure, such as pyloroplasty . Selective (total gastric) vagotomy. The main vagal trunks are dissected to the point where the branch leading to the biliary tree divides, and there is a cut at the section of vagus close to the hepatic branch. This procedure is rarely indicated or performed. their sensitivity to stimulation and the release of acid. It does not require a drainage procedure. The branches of Latarjet's nerve are divided from the esophagogastric junction to the crow's foot along the lesser curvature of the stomach. 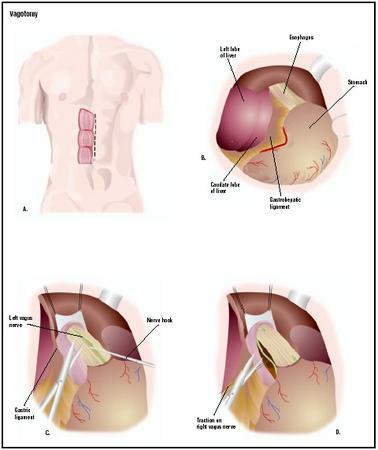 Thoracoscopic vagotomy. Performed through the third, sixth, and seventh left intercostal spaces, the posterior vagus trunk is isolated, clipped, and a segment excised. A vagotomy is performed under general anesthesia. The surgeon makes an incision in the abdomen and locates the vagus nerve. Either the trunk or the branches leading to the stomach are cut. The abdominal muscles are sewn back together, and the skin is closed with sutures. Often, other gastrointestinal surgery is performed (e.g., part of the stomach may be removed) at the same time. Vagotomy causes a decrease in peristalsis, and a change in the emptying patterns of the stomach. To ease this, a pyloroplasty is often performed to widen the outlet from the stomach to the small intestine. A gastroscopy and x rays of the gastrointestinal system determine the position and condition of the ulcer. Standard preoperative blood and urine tests are done. The patient discusses with the anesthesiologist any medications or conditions that might affect the administration of anesthesia. Patients who have had a vagotomy stay in the hospital for about seven days. Nasogastric suctioning is required for the first three or four days. A tube is inserted through the nose and into the stomach. The stomach contents are then suctioned out. Patients eat a clear liquid diet until the gastrointestinal tract regains function. When patients return to a regular diet, spicy and acidic foods should be avoided. It takes about six weeks to fully recover from the surgery. The sutures that close the skin can be removed in seven to 10 days. Patients are encouraged to move around soon after the operation to prevent the formation of deep vein blood clots. Pain medication, stool softeners, and antibiotics may be prescribed following the operation. Standard surgical risks, such as excessive bleeding and infection, are potential complications. In addition, the emptying patterns of the stomach are changed. This can lead to dumping syndrome and diarrhea. Dumping syndrome is a condition in which the patient experiences palpitations, sweating, nausea, cramps, vomiting, and diarrhea shortly after eating. Gastric or esophageal perforation. May occur from an electrocautery injury or by clipping the branch of the nerve of Latarjet. Delayed gastric emptying. Most common after truncal and selective vagotomy, particularly if a drainage procedure is not performed. People who use alcohol excessively, smoke, are obese, and are very young or very old are at higher risk for complications. Normal recovery is expected for most patients. Ulcers recur in about 10% of those who have vagotomy without stomach removal. Recurrent ulcers are also found in 2–3% of patients who have some portion of their stomach removed. In the United States, approximately 3,000 deaths per year are due to duodenal ulcer and 3,000 to gastric ulcer. There has been a marked decrease in reported hospitalization and mortality rates for gastric ulcer. The preferred short-term treatment for gastric ulcers is drug therapy. A recent review surveying medical articles published from 1977 to 1994 concluded that drugs such as cimetidine, ranitidine, famotidine, H2 blockers, and sucralfate were efficient, with omeprazole considered the "gold standard" for active gastric ulcer treatment. Surgical intervention, however, is recommended for people who do not respond to medical therapy. Ansolon, K. B. Developmental Technology of Gastrectomy & Vagotomy. Rockville, MD: Kabel Publishers, 1995. Kral, J. Vagal Nerve Function. New York: Elsevier Science Ltd., 1984. "Stomach and Duodenum." In Current Surgical Diagnosis and Treatment, 10th ed. Edited by Lawrence W. Day. Stamford: Appleton & Lange, 1994. Chang, T. M., D.C. Chan, Y.C. Liu, S.S. Tsou, and T. H. Chen. "Long-term Results of Duodenectomy with Highly Selective Vagotomy in the Treatment of Complicated Duodenal Ulcers." American Journal of Surgery 181 (April 2001): 372-6. Gilliam, A. D., W.J. Speake, and D. N. Lobo. "Current Practice of Emergency Vagotomy and Helicobacter Pylori Eradication for Complicated Peptic Ulcer in the United Kingdom." British Journal of Surgery 90 (January 2003): 88-90. Saindon, C. S., F. Blecha, T.I. Musch, D.A. Morgan, R.J. Fels, and M. J. Kenney. "Effect of Cervical Vagotomy on Sympathetic Nerve Responses to Peripheral Interleukin-1beta." Autonomic Neuroscience 87 (March 2001): 243-8. American College of Surgeons. 633 N. Saint Clair St., Chicago, IL 60611. (312) 202-5000. http://www.faacs.org . Society of American Gastrointestinal Endoscopic Surgeons. 2716 Ocean Park Boulevard, Suite 3000, Santa Monica, CA 90405. (310) 314-2404. http://www.sages.org . "Laparoscopic Vagotomy." SAGES web center. http://www.sages.org/primarycare/chapter19.html . Tish Davidson, A.M. Monique Laberge, Ph.D. Patients who receive vagotomies are most often seen in emergency situations where bleeding and perforated ulcers require immediate intervention. A vagotomy is usually performed by a board-certified surgeon, either a general surgeon who specializes in gastrointestinal surgery or a gastrointestinal endoscopic surgeon. The procedure is performed in a hospital setting. What are the possible complications involved in vagotomy surgery? What surgical preparation is needed? How long is the hospitalization? How many vagotomies does the surgeon perform in a year? I suffer from an ulcer that won't go away with normal meds, had for 4 months now. the doctor is considering a thoracoscopic vagotomy. everything i've read on the internet has to do with the old vagotomies where they open you up completely and as this is explained, has a serious recovery time, hospital stay and process. i can't find anything about this procedure the way it's done laproscopically. if anyone can let me know about this, it would be appreciated. the doctor said it's done with the three small incisions in the chest, they snip the nerve, you have a drain in one of the incisions for a day, only in the hospital for a day and then the recovery time is much shorter by weeks, than the 6 weeks i read everywhere. any information that could be provided would be appreciated. I need all the help with information on this. I am having to go to Birmingham,Ala. tomorrow to talk to a surgeon about it. I have had the gastric bypass 6yrs ago and I have coded 17 times 94 transfusion. This past April another ulcer ruptured and I almost didn't make it. I have to have a EGD every 3 months and now I have another one. In all I have 3 anastomosis and they are huge and medication hasn't help and they told me that this was my last hope. I have it in black and white that the surgery I need to remove the rest of the stomach I have a 1 in 3 chances of making it and if I don't then I have 0 chance to live. So you see I am in the last stage for help. My hematologist said if I had cancer,aids or hepatitis he could treat me. I don't know about ya'll's pain but mine is so bad that I have thought of ending it. My Dr. take care of me but also my liver is so damaged that when I had the surgery they let my spleen rupture in me and I was in a coma for 11 days and I have battled for my life every since. I will end and hope someone can give me hope on this procedure. I am 16 years old and I have Helicobacter Pylori and I currently have 4 ulcers. acid ever. I have really bad acid reflux, but nothing will help it. I have tried everything! I am a 40 yo male who recently had a Highly Selective Vagotomy (5 months ago). I am still in servere lower adom. pain and can't eat anything. I feel close to death at times - after eating I sweat and have the dumping symdrome. I have never felt intense pain like this. My body is going into shock. None of the doctors know what to do. I am on a ton of RX that don't help. I regret having the Vagotomy. I was well before (just had ulcers) and now I am disabled from this condition. IS THERE A REVERSAL to VAGOTOMY? WOULD A Gastroenterostomy CLOSURE help me? My stomach no longer can digest any food. It's like I have no acid and the food dumps directly into the small intestines. When I was 21 I had a vegotomy because of a perforated ulcer. I am now 49 and have seen so many gastroenterologists over the years that I can't count them all. I have learned to control my diet (smaller meals, no liquid with meals, avoid certain foods), but 2-3 times a year the condition gets severe and I end up in an emergency room. the symptoms start like this: I start belching a bad tasting and smelling gas that rapidly increases in intensity. Pain in the gut starts and gets more severe, to the point of doubling over. The palms of my hands turn bright red and hives start from there and spread all over. I get very itchy. My blood pressure dramatically increases. I get nausea, sometimes I start vomiting. I end up in the emergency room and they give me a steroid shot that settles it down, sometimes right away, sometimes it takes 15-30 minutes. My last visit to a gastroenterologist was hopeful in that he gave me a prescription for Levsin. He said that the next time the symptoms start take one of those pills under the tongue and the symptoms will back off. Well a month ago the symptoms started so I took the pill, but the symptoms kept coming on, so after looking on line for dosage recommendations I took 2 more pills about 2.25 hours later (.125 MG per pill) but the symptoms seem to speed up and I had more pain than ever. The hospital gave me a steroid shot and it settled down. Here's the thing. I need something to stop those symptoms in their tracks. This summer I'm going to Mexico on a mission trip and I'm scared that it could happen down there and I'd end up dead. I had a highly selective vagotomy performed 22 years ago when I was 35 years old. I had a history of two duodenal bleeds that I successfully recovered from. But disaster struck after I had gone several days without food, was forced to drink large quantities of ice water, was repeatedly slapped in the stomach, and was kept in a shivering state of cold for 48 hours. As a result of those conditions, I developed a perforation that caused peritonitis. Luckily, I got the treatment I needed just before expiring. My stomach was patched and but the physician told me that I needed an HSV performed but I should recover first. So, one year later they reopened my the 10 scar and performed the HSV. I have gone into the full history so that you understand how much trouble I was going through. The HSV worked. I was in Army Special Forces and I continued to serve in that capacity for another 12 years. For about 10 years I had NO gastric pain at all. I was able to eat foods like pizza, hot dogs, and spaghetti without the heartburn I had experienced all my life. I did have an occasional bout of dumping syndrome that made me woozy for about 20 minutes but that was almost always caused by eating too much starchy food. After many years an occasional heartburn has returned. It is associated with eating the same foods that used to give me trouble. I take tums when it happens and the burn goes away. These days I must sleep with my head elevated or I get gastric reflux. The bouts of dumping syndrome are very rare. Much of the success of the HSV has worn off in later years and now, at 57, I am starting to experience what feels like the start of my problems when I was 17. But the HSV allowed me to continue in my high risk profession without any significant side-effects. It allowed me to enjoy a nearly trouble free life for over twenty years. I traveled many places in many countries and made many forays into the wilderness. It wasn't all work. I took my family on several overseas trips, and some of the wilderness trips were for camping, hiking, or hunting. The HSV wasn't painless and it left a big scar but it was well worth it. I am glad I had it done. i had emergency surgery last monday to repair a perfroated ulcer i didnt even know i had (long stupid story). Anyways all went well and got home from the hospital on friday. i am now just looking for any information the surgery and recovery time ect. it was a full repair job so it was not done laparoscopy but full abdominal. i UNDER WHEN A VAGOTOMY 39 years ago at age 32. It was an emergency opeartion.I was advised by the medical staff that I had a deseased vagus nerve. I have lived with the side effects since the sugery. according to exrays the surgery involved severing the vagus nerve and cliping the ends ny medal clips. the vagus nerve controls the stomach muscles that are needed to push the food stuff out of the stomach.the results is bloting. it was very ok, i would also like to work on such kind of structure will you pleas guid me. I was sixteen when I was diagnosed with Barrett's Esophagus way back in 1978. I had a major GI Bleed and prior to that I always had indigestion ever since I was three-four years old. I am not obese and I didn't then and I don't now abuse alcohol. I have never smoked cigarettes. In March 1985 after seven years of endoscopes and biopsies, I was finally told that I needed to have surgery. Clay Phillips MD from Strong Memorial Hospital in Rochester NY performed the surgery. It was a long recovery period for me. I had a Nissan Fundoplication along with a highly selective Vagotomy. I suffered from dumping syndrome for about two to three years after but was able to realize what it was I could and could not eat. I took heavy doses of anti-diarrhea medicines. I am now 48 years old and I have not had indigestion since before the night of my surgery back in March 1985. However, after working in surgery and scrubbing on cases and assisting, I learned that vagotomies were not performed anymore unless it is a last resort. Although the vagotomy took away my acid reflux and probably saved me from having esophagus cancer, I was not free of downfalls. I have spent most of the past twenty five years with horrible irritable bowel syndrome, malnutrition, and colitis. These are conditions I did not have prior to the surgery. It is very hard lately because everything I eat turns into diarrhea. I am immune to Imodium and there doesn't seem to be any answer to controlling these problems now that I am just shy of 50 years old. If anyone has been affected in the same way, please let me know. Also please let me know of any medications you may be taking. God bless everyone...I have seen too many people die from cancers of the digestive tract. We are all the lucky ones no matter what our side effects are. hi just looking up details of the op.i had 1975 in england.i was experiencing terrible pain in the gut area.i had the vagotomy op.got ta tell ya at the time it was a bit hard.but very much well worth the effort.i`ve spent the last 36 years pain free no complications and so glad i did it! my son had the same thing but it had been discovered ( by a perth doctor (aus)) that it was caused by bacteria helicopacter pyloris and just now takes medication. i`m a fit healthy 72 yrs old! I had a vegotomy when i was 27 and 28 years later after having some success i have horrible gastric problems. I went to the doctor and he said I had an abdominal hernia due to the surgeon not sewing my muscles correctly. I have a scar just above my pubic line to the bottom of my breast. Has anybody had the same problems. I now have to have a surgery that is very painful and difficult. i had a vagotomy in 1973 at the age of 23yrs at the time i was so depressed due to suffering with acid when eating @ drinking, i worked long hours and always had rennies with me , i might tell you i lived on them. my G.P. was against me having the op but i was fed up of suffering and never enjoying a social life as i couldnt drink alc. I have sufferd with dunping synd ever since and in the beginning at times wished i was dead because of the suffering which effected my whole family life .I am taking anti acid medication ( losec ) which are great for reducing acid , i have been taking them since they were introduced in this country it must be 20yrs now . I was told to stop taking them for 2 weeks and had to start taking them again after 1 wk due to acid again but can't do without them now. I notice that all these posts are older. Is there newer information? I am going this week to see a surgeon about having this procedure done. I'm not so sure I want it done because of the side effects. I have tried to reply to your question but it keeps telling me no bad language or the code is wrong. I'd like to know what I'm doing wrong? I had my op in 1981 age 29 years. After 10 years of pain & indigestion, throwing up out of my nose & mouth if I bent down, I had had enough. Prof.Copeland at Royal North Shore, Sydney, performed my op & he told me to try & eat as lightly as possible for as long as I could. I went straight back to work after 3 months, as had 5 kids to support & suffered through it with long periods of hiccups, weight loss (went down to 7.5 stone, previous weight was 10.7 stone) & ended up with a hernia. I am now coming up to 60 & feel fighting fit, eating anything that I want & it's great. I think that the side effects are better than the symtoms & doing nothing about it. Three out of my 5 children who are now in their 30's suffer from some form of stomach problems so it must be an hereditary thing as my mother & father both sufferer & still do from gastric reflux & have to watch everything that they eat. Whoever is out there thinking of having an vagotomy "DON'T DO IT". I have suffered these last 34years with dumping syndrome associated with all the conditions in which I experience palpitations, sweating, weakness, nausea, cramps, vomiting, and diarrhoea shortly after eating every meal. Dr said that he was only cutting the nerve that produce the acids, but failed to mention that the procedure also involves removing half of the lower stomach and valve control to the small intestines. Thus food is dumped into the small intestines causing pain after meals, and diarrhoea etc. I have lost lots of weight and have to watch whatever I eat, cannot go outings due to having to be close to toilets. I have diarrhoea everyday about 3 to 4 times a day. Like many of you I had a vagotomy in my 20's due to a perforated stomach caused by ulcers. For 15 years I had dumping syndrome, I'd have to eat child size meals and often got a pain in my left shoulder, 20 minutes after which I'd get excruciating cramps and need to be within 10 seconds of a toilet as my bowel would empty involuntarily. Eventually my doctor suggested I try losec (omeprazole) and within 24 hours I was able to eat, or not eat normally, and toileting became pain free and controllable. I didnt have the helicopacter pyloris by the way. Now 30 years later I'm having more gastric reflux and have had to stop the omeprazole for 1 week so a 24 hours acid test can check my acid production and oesophagal sphincter operation. Within 36 hours my dumping has returned and I'm dreading the next 6 days before the procedure. However better to have had the vegotomy as I would have died had I not had it and the partial gastrectomy, and thank heavens for omeprazole! I wish you all well and hope you find solutions to your particular problems. I am suffering form Nissen fundo with accidentel injury! PP test came out al compared total vagotomy!! Fighting this for 3 ,5 years now!! So tired off this!! Please is ther anyone who can offer help maby undo the Nissen.. I have a vagotomy and a partial gasterectomy in 1991. Never looked back. I was cut from my breast bone to my pubic bone, it was a rough surgery. However, it did me a world of good. I had many ulcers, had I not been in surgery, it's highly likely my stomach would have proforated and I would have not made it. I have RA and have been on steroids and antiflamatories for years, which caused my problems. I was on Losec, Zantac as well as carafate at the time. The pain I had been through for years was over when I woke up after surgery. It was NOT a cake walk, but I believe it saved me. By the way, my surgery was down in a tiny SE Alabama town called Geneva, Al. I did and do occasionally have the Dumping, and I sometimes need B12. I am now on Nexium, and occasionally Carafate. My boyfriend had a vagotomy, quite a few years ago now, because of very bad ulcers. Since then he has lived with dumping syndrome (pain, sweating, nausea, collapse) and acute pain, which has made it almost impossible for him to work and has impacted negatively on most aspects of his life. Maybe at the time it was the only thing that could have helped him, but you wonder whether it was worth it and why there seems to be no effective help from the medical establishment afterwards. And why is it that social services in the UK don't recognize what a debilitating condition this is? Had the vagotomy on April 17 2014. Took out 20% of my stomach. 3 ulcers from years of aspirin and stress. Got down to 135 pounds. Up to 155 on July 4th. Feel good. Scar sore at times. Had raging heartburn and acid reflux. Food was staying in my stomach 8-10 days. I was getting no nutrition, vitamins or minerals. I am 61 years old and had suffered nearly 10 years. Surgeon was great explained everything thoroughly. In hospital for 7 days. Back to school in 3 weeks. Procedure done on San Angelo Texas. Hi, I had a partial gastrectomy removing 2/3rds of my stomach at 17, then a vagotomy 27 years later. Having the vagotomy was the worst thing I had done as it left me with dumping syndrome,(vomiting, diarrhea, palpitations, etc. etc) I then had to have a roux-en-y conversion due to the bile in my stomach and esophagus. At the same time this conversion was done they also repaird a VERY LARGE hiatal hernia. The hernia was caused from all of the vomiting after the vagotomy. Since the vagus nerve is the nerve that goes from the brain to all of our organs it can affect other things too. It has had a big part in my high blood pressure. I am on blood pressure medicine and even with it my blood pressure is all over the place. Worse in the mornings and after meals. I was 17 when this roller coaster started and I am now 70. My body has finally adjusted to my diet and I no longer have any discomfort except for this darn blood pressure problem. Anyone considering having a vagotomy, think twice and gather all of your facts before hand. Be aware, it is not something that will cure everything and will probably create other problems. Hello everyone, I am now 73 years old and had a vagotomy operation by a British surgeon when I lived in Africa. I had a deudinal ulcer which wouldn't dry up and also,a,twisted bowel from an injury in the sixties. He did both operations and my recovery time was very good with (bung) being removed after 4 days. That's when the trouble started, I just couldn't stop the runs, I was being drained every twenty minutes. The hospital gave 4 little white pills which I took a very 4 hrs but it still didn't make any difference. By the way I had the operation in 1982. My weight went from 9 and a half stone down the 7 stone. I left Africa in 1987 and settled back in England where I immediately saw a doctor and explained the problem to him, he said straight away that I had the dumping syndrome and prescribed Imodium. I have been on them now since 1987 ( Imodium ) and if it wasn't for them I think I would be dead by now so they do work for some people. If I had the same chance now I would never have had the operation especially after finding out it was caused by an infection. My advice to anybody thinking about having the operation please don't because you will have more trouble than you are experiencing now. Get the medics to kill the infection and you should be fine. If any body wishes to contact me please fell free. All the very best to you and please try not to worry about it too much. I had a vegotomy and modified bill roth II at the age of 4 after a full year of probes and testing for three episodes of a bleeding duodenal ulcer in 1974. It is now 39 years later and a specialist is telling me that i should see a surgeon to reverse the bill roth and perform a gastric bypass. I digest 600 times slower than an average person and have two exits to my stomach - one through the duodenum and one where they attached my small intestine to the other side of my stomach. There is nothing pulling my food through. I eat very little meals, all throughout the day and sometimes it feels as if my stomach is just paralyzed completely. I'm going for a second opinion as I am no looking forward to another incision on my abdomen. Prevacid & gas-x have been the only meds that have helped me the past ten years, but my stomach seems to be getting worse. They are recommending that i start pureeing my meals or eat baby food. What kind of quality of life is this? Has anyone had anything similar and had a successful reversal of a bill roth 2 and vegotomy? I had emergency surgery for a perforated ulcer when I was in my late 30s. Medical coma, long recovery, back to work. Then, a year later, I had another surgery to remove the scar tissue from the first surgery and a vagotomy. All worked fine until I aged...I am now 75 years old. Have developed high blood pressure, which is up and down, depending on when I eat, or the time of day. I have also developed more and more dumping syndrome over the past 10 years. Salads, just about any food can be found in my stool/feces...you can tell what I ate the previous night, or a couple of hours before the dump. I'm being treated for acid reflux with Nexium, which works for the heart burn that was originally diagnosed as angina. I'm on doses of BP meds and beta blockers. The 'dumping' is not controlled, but is helped by a Welchol drug prescribed by my gastroenterologist. Most of the posts I've read seem to mirror the symptoms I've developed since the surgery was done. My cardiologist and my gastro doc both say that the read about this surgery in med school (yes, I'm old, and it was a new surgery then...only done for about 2 years, then abandoned when they found that h. pylori was the major cause of ulcers. I was tested, and yes, I was riddled with the stuff. A course of antibiotics has kept me symptom free of the ulcer for over 20 years...but in the last few years I am developing symptoms that are not consistent with heart disease...a nuclear stress test showed my heart is strong. I suffer from PAD, COPD, ...smoker. The dumping and inability to know what and when I can eat limits me, but small meals, several times a day seem to work. Little fat, lactose free milk if any dairy. I would not recommend this surgery unless you are young enough to anticipate some way to reverse it as you age. My niece had the surgery, 1/2 stomach removed from two ulcers and some work done on bowel area. Signed herself out of hospital on the 5th day. Draining tube for stomach still in. What would happen if she would drink a beer. She is halusanations. I am so happy I found this web site. I don't feel so alone anymore. Everything I have read are the same symptoms I have had after a vagatomy then loosing my gal bladder. My ulcers were caused from thanking an anti inflammatory drug called Viox. The end of the stomach cut off and then a vagotomy. I just turned 60 and the surgery was 10yrs ago. I suffer more pain than I did with the ulcers but it's different. The ulcers were bad and my stomach was eaten up. I had no choice. Nothing would have worked for me but surgery. So you have to listen to the doctors sometimes. They will let you know what is best. Nothing is perfect but I am still on this earth enjoying my children and grandchildren. Yes there are a lot of things I can't do or enjoy anymore but like I said, "I am still here". I had a Vagotomy & Pylorplasty in 2009 spent 5 days in hospital. Immediately had dumping syndrome , nausea daily and lost 30 lbs. Lost my job at 61 yrs.old 6 months after surgery, couldn't stay out of bathroom. Would be late for work because I would have to turn around and go home because have accident in my car. I am on 3 medications and doing some better. Waking up in the night chocking with acid reflux. Thank you! I had a ruptured ulcer and vagotomy about 25 years ago. I have been hesitant to complain since I thought the acid flow was supposed to be gone. Popped back up with a passion! The diarrhea which has followed I have complained a few times but specialists had no real idea so I take lomodil, it is only a patch. The reflux was maintained by protonix for years, the insurance stopped paying. Nothing else is working( I paid out of pocket for protonix but the magic was gone there too)Then I started suffering from plugged ears, and through research discovered severe reflux can affect the Eustachian tubes especially on the ear I sleep towards! However most doctors will not listen to patient research . My symptoms did not fit until now. I am such an active person at 66 and only my husband knows some of my struggles. No real cure was mentioned in these comments but at least I understand the problem! I am not a hypochondriac! I have had the Vagotomy & Pyloroplasty procedure back in 79/80 which also involved the severing of the Vagus nerves and also the cutting of the stomach,Within a few months i started to suffer with all the systems that have been said on here,For yrs it was called Dumping Syndrome my treatment was to be told to carry Mars ars around with me..?? As during the frequent attacks i was suffering it was as though i needed to eat anything sweet to get the sugar levels back up,I have suffered from all the symptoms previously mentioned and it has ruined my life regarding work military service and still goes on,I have never been treated for this condition and i am now 66 yrs of age, But i am so glad to be able to see that there are other people out there who suffer as i do. Its been a Lonesome Road. I have done research on the effects of having an ulcer (although I do not know which one.) I am having sleep deprivation due to this it wakes me up 5-6 times a night but since its been getting worse i have been waking up from 1-3 am and i haven't been able to go to sleep the rest of the day no matter how tired i am . In the past week i have been in pain and i have missed about 12 days of school due to this and i will continue to miss school. The doctors have not been able to do anything thing because they have no idea what it is. They didn't think to check for an ulcer. I'm going back to the doctors today and specifically requesting to check for an Ulcer. I have lost 5 lbs in the past week my wrist and part of my arm are small enough for me to wrap my hand around i am getting pale and to be honest this pain is making me very irritable. I vomit i have diarrhea and yes i have a lot of gas due to this. Whenever i try to eat something i vomit it back up or it goes down to my stomach and the effects of this sickness amplify. I'm having back and chest pain. on top of that the doctors can only prescribe probiotics and that doesn't do Jack Squat im spitting blood and im constantly tasting blood but when i vomit no blood comes out . I need help can someone tell me what this is? Please.